The affection between George III's two youngest sisters is reflected in this portrait, which was commissioned by their mother, Augusta, Princess of Wales. The painting shows the 17-year old Princess Louisa, who was to die unmarried at the age of 19, seated beside a music stand. With her left hand she holds a guitern (an early form of the guitar); her right hand rests on a musical score. 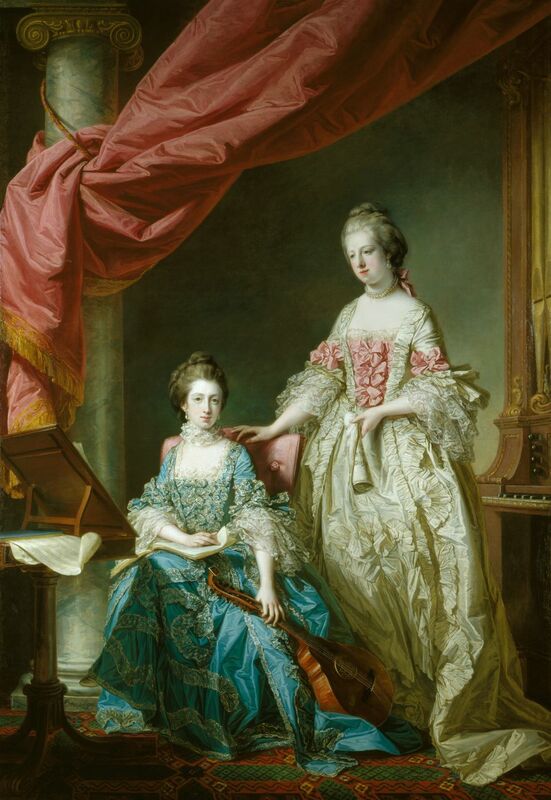 The younger Princess, 16-year-old Caroline, stands next to her sister with one hand resting on the back of the chair and the other holding a roll of music; a chamber organ is shown to her right. The portrait was commissioned shortly before Caroline's marriage to her first cousin, Christian VII, and her departure for Denmark in October 1766. She sat to Francis Cotes for two pastel portraits (Palace of Frederiksborg, Denmark, and collection of the Prince of Hanover) while she was still in England; these were to serve as the model for this image which was completed after her departure. The bridegroom's father, Frederick V of Denmark (who in 1743 had married George II's daughter, Princess Louisa; she died in 1751), had originally proposed that Christian should marry Princess Louisa; however her bad health prevented the match and the younger sister was instead chosen. The marriage took place in October (by proxy, in London) and November (in person, in Denmark) 1766, following Christian VII's accession to the throne (on his father's death) in January of the same year. Christian VII was entertained in state during his visit to England in September 1768. However, he was volatile and weak and Caroline eventually embarked on an affair which was to involve her in national politics. The discovery of her relationship led to her downfall and divorce (in 1772), as well as the execution of her lover, the King's physician Johann Struensee. She was permitted to leave Denmark in 1772, although without her two children, and George III arranged for her to live at Celle in Lower Saxony, where she died two-and-a-half years later, at the age of 24. Christian VII's own mental derangement led to the establishment of a regency - under his and Caroline's only son, the future Frederick VI - in 1784. A founder-member of the Royal Academy, Francis Cotes made extensive use of pastels, which may explain the delicacy of handling in his oil paintings. His style was closer to that of Allan Ramsay than to that of Joshua Reynolds, and thus his paintings were more to the taste of the royal family. This is one of his finest oil paintings, combining regal portraiture with bravura handling and psychological insight. It hangs in its original carved tabernacle frame, one of a pair supplied in 1768 by John Bradburn for £125 19s. The music table in the portrait may well be by the same maker.